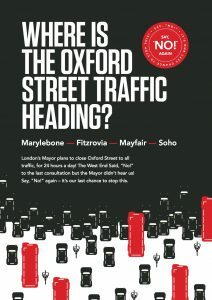 Residents in Marylebone, Mayfair, Fitzrovia and Soho are not convinced by the various pledges and assurances given by the major parties concerning the pedestrianisation of Oxford Street. The only pledge that they want to hear is the one which promises to work to get rid of the terrible scheme that the Mayor, TfL and Westminster Council propose to inflict on their area. 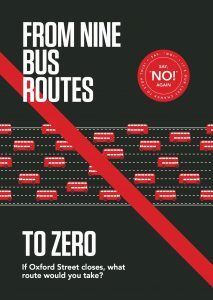 This is a scheme too flawed in its basic concept to be altered by pledges and it should be scrapped before it is allowed to cause havoc on the streets of the West End. Up until last week local residents were in danger of going into the May 3rd elections without one councillor or candidate from any party who was prepared to categorically speak out against the scheme. Now, however, the residents themselves have taken positive action and formed a party to do just that. This new party is standing three candidates, one in each of the three wards most affected by the scheme. The party is called CAMPAIGN AGAINST PEDESTRIANISATION OF OXFORD STREET. It is not a political party as its name makes clear. It is a campaigning group. 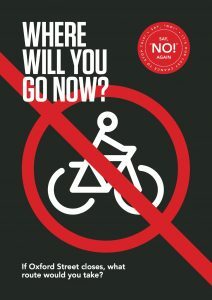 The party has only one purpose in its constitution, only one subject that it is campaigning on, but it is one that will affect the West End more than any other single issue – the proposed pedestrianisation of Oxford Street. The new party’s single purpose is to oppose pedestrianisation and to show that there is a better way to improve the area. It is neither affiliated to, nor does it support, any political party; its stance is above party politics. This is made clear in its motto: “two votes for your party, one vote for your neighbourhood”. In this way it hopes to appeal to those of all political persuasions, because it operates across all political boundaries. CAMPAIGN AGAINST PEDESTRIANISATION OF OXFORD STREET candidates are standing in the three wards that surround Oxford Street: Bryanston and Dorset Square Ward, Marylebone High Street Ward, and West End Ward. Each of the candidates fielded is a prominent, long-standing, non-political residents’ representative from the local area. They know what residents are saying, they know what residents want, and they intend to give them a voice.